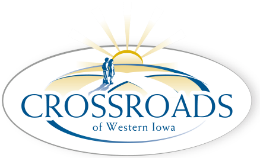 Our staff has a strong commitment to serving the many consumers of Crossroads of Western Iowa. But first and foremost, they focus their energies on creating awareness for the needs of those receiving services, and solicit the financial and volunteer support from people throughout the community. Ric Miller serves as the Director of Development & Communications, with the full support of the Leadership Team at Crossroads of Western Iowa. Our board represents a cross-section of several communities and has a passion for our organization and those we serve. The members work hard to ensure long-term sustainability of the organization and oversee that the funds raised directly affect those in need. Brent Dillinger, Crossroads' CEO, serves as President of the Foundation Board. Matt Zima, Crossroads' CFO, serves as Treasurer of the Foundation Board. Board Members include: Tom Hanafan (Council Bluffs), Nicole Steier (Omaha), Colleen Brabec (Council Bluffs), Rhonda Capron (Sioux City) and Justin Connealy (Omaha).